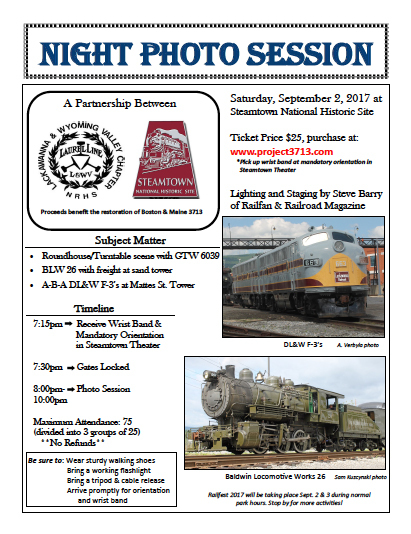 The Lackawanna & Wyoming Valley Railway Historical Society and the Steamtown National Historic Site are pleased to announce a very special Railfest 2017 activity: a night photo session at the park to benefit the restoration of Project3713. Download the full PDF flyer here. All participants must arrive for mandatory orientation and wristband distribution at 7:15pm in the Steamtown Theater. Gates lock at 7:30, no late arrivals can be accommodated.